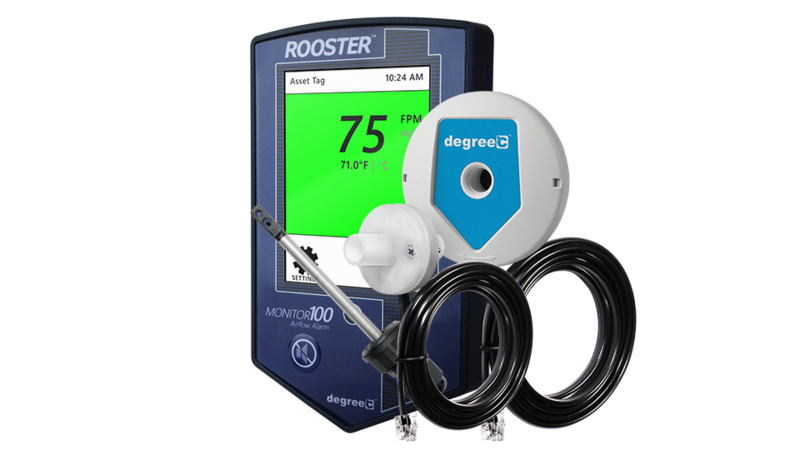 Rooster Monitor100 | Degree Controls, Inc. The Rooster™ Monitor100 is the next-generation airflow monitoring and alarm system for critical containment applications, including chemical fume hoods, biological safety cabinets, laminar flow hoods and other applications where airflow is required to be viewed, monitored, alarmed, and communicated to building and laboratory systems. This video guide will get you from boot-up through the initial calibration procedure. Whole-screen background colorization to convey current state augmented by flashing red LED while in alarm state. Accepts side-flow sensor for negatively pressurized cabinets, insertion probe for exhaust ducts and inline retrofit design to replace legacy airflow alarm monitors. Built for laboratory professionals, the built-in LCD screen of the Rooster™ Monitor100­ works with or without gloves. Dual password protection allows users to personalize operational experience, but not override safety features set by facility managers. USB port allows for in-the-field firmware updates. Instrumentation-class sensor, compatible with latest 2014 NSF requirements for repeatability and high accuracy calibration. Fast and intuitive set-up, with no need to have manual on hand.